This is the first lesson on professional photo shooting for Manfrotto. Pratical lessons referring to real works. You will learn how i took pictures that probably you know well and professional techniques in different fields. Last but nost least, thanks to video, pictures and schemes you will be able to enter in the backstage of important shooting. 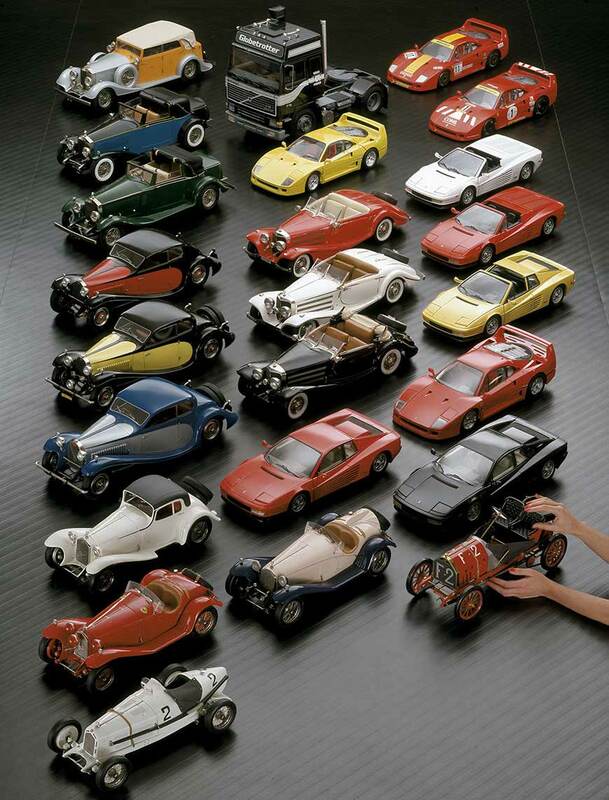 The first time I shot cars was in 1991 for an assignment from Bugatti Automobili and Franco Maria Ricci Publisher. I had to shoot the twenties and thirties Bugattis for a book, “Divina Bugatti.” This book became later a milestone in automotive publishing. Bugatti Type 057S Atalante – Chassis 001 (1931) – Owner, Franz Wassmer, Switzerland – Light scheme 1. For an incredible coincidence, his father was the owner of the Atalante I shot seventeen years before and presented in the first part of the lesson. Hasselblad H3DII 39MS in multi-shot mode – zoom lens HC50-110 at 105 – 5 sec. F.16 – Several shots layered in Photoshop. The beginning was very hard. 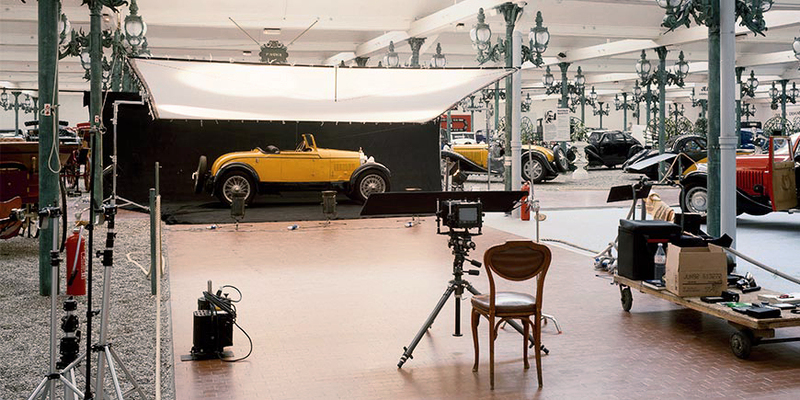 I had to shoot on location at Musée National de l’Automobile at Mulhouse, Alsace, but… let me tell my story. In 1991, I was working for Bugatti Automobili. One day Franco Maria Ricci, who already desired to celebrate the myth of the Bugatti, suggested to Romano Artioli, the company owner, the idea of a book on the legendary label. They reached an agreement and the idea went through. Naturally, Artioli mentioned “the best photographer in the word” to Ricci, actively encouraging my candidacy for the job. Ricci, as expected, was skeptical. “I have my photographers, ones I trust”, he said with a half smile. The persistency of Artioli gained me a meeting with Ricci. “Go and take a few shots; we’ll see”, he said to get rid of me. I felt well-equipped on my departure. 145 different accessories in the trunk of my station wagon. 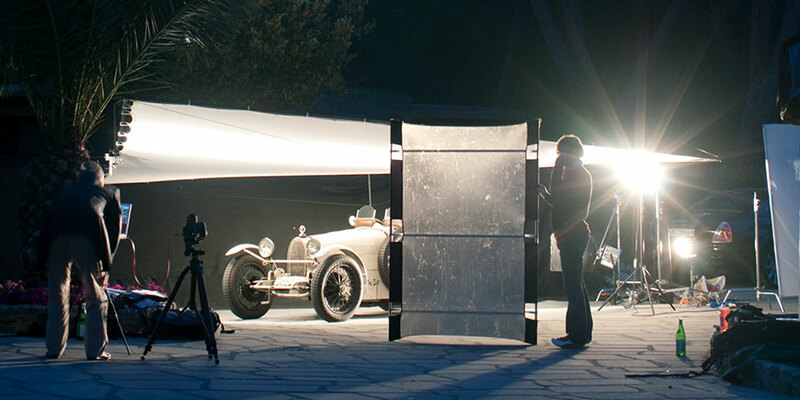 For months, I had been working on how to build a mobile set around a Bugatti, on location. Before violating that holy ground, I carried out a test: I photographed a modern car in a large shed. It worked, so I decided to go ahead. After arriving at the National Museum of Automobiles at Mulhouse in Alsace, I started my nocturnal marathon. In the dangling atmosphere, in the eery silence, I came face to face with the Divine. The situation reminded me of one of Hemingway’s stories: the bull and the lion still before the charge. I was almost worried that the steel muscles could explode, at any time, in all their power and the beast within could run me over like a train. I had an emotional outburst, I felt like I had a fever. As a robot, I kept shooting and opening Polaroids. I was looking at Her but I could not see inside Her. Fatigue and tension made everything even more dramatic. “What am I doing in France, in the middle of the night, in the dark of a museum? Why didn’t I stay at home?”, I started thinking. 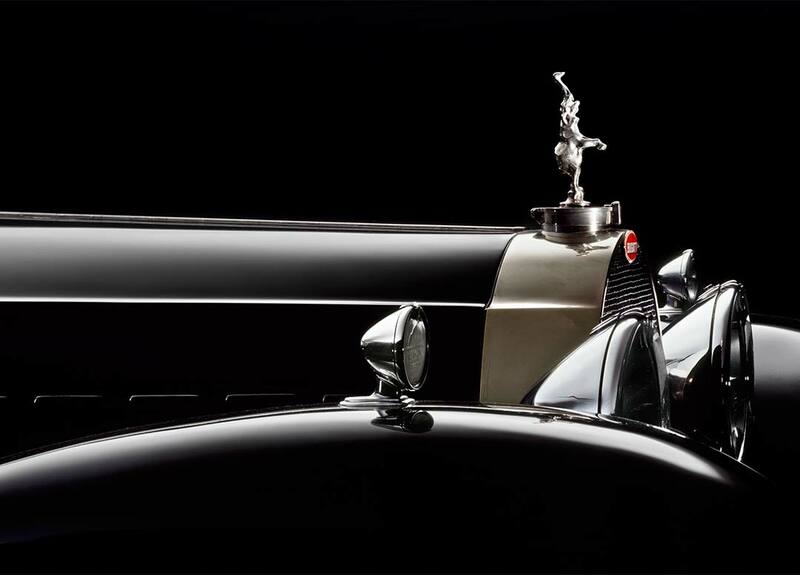 Bugatti Type 41 Royale Coupé Napoléon, the personal car of Ettore Bugatti with the elephant, symbol of Bugatti’s luxury, designed by his son Rembrandt. All of a sudden I had reached the turning point: I opened yet another Polaroid, but this time I found the courage to look at it through a photographer’s eye. I had recognized Her, the Divine, in all her dazzling beauty. “I am yours. Only you will be able to own me”, she was saying. I started dancing like I was in the middle of the Rio de Janeiro carnival parade. I didn’t feel tired anymore. “I did it!”, I said, my voice echoing in the empty museum. I had finally gotten a hold of the situation. I had jumped on the wild horse, and I was riding as a Native American would. I arrived at Franco Maria Ricci, feeling confident and seeming cold blooded like a contract killer. I knew I was in the presence of one of the most refined editors the world had ever seen, but I also knew that I could not fail: if he had any taste at all – and it could not have been otherwise – he could not stay indifferent after seen my work. Ricci received me with a smile which was more gentle than polite; the smile you would give to a child who is showing you his drawing. After his eyes laid on the first photo, his expression changed and suddenly brightened. “But they are… lit!”, he whispered to himself. “Of course they are! Did you think I would bring you the dark ones?”, I answered in friendly yet amused manner. It felt like I was watching from the outside as if I was the spectator of a film. Franco Maria Ricci picked up the phone. “Come and look at something sensational!”, he said and then ran down the corridor enthusiastically. 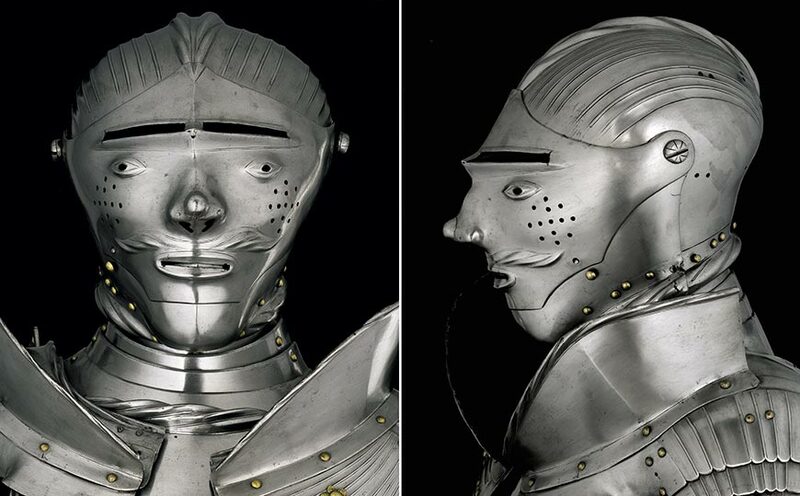 “Call the others and tell them to come to my office.” He looked at me excitedly in front of all his associates, as if I was a superhero, and offered me some incredible projects: about Spanish Baroque style, on medieval armors, about the city of Parma, and on French ebony-cabinet-makers. He had just assigned me all his following projects. I had managed to greatly impress Franco Maria Ricci, the king of aesthetics! To think only a few years before, all I was able to impress was a film. For this first lesson, I will present you two different works on Bugattis. 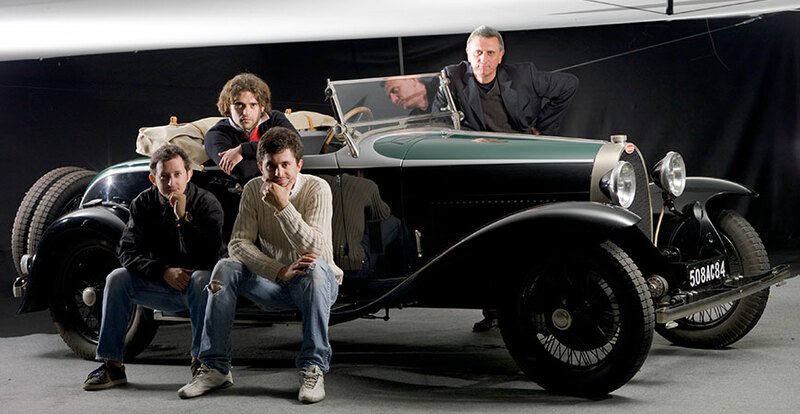 The first one of 1991 for “Divina Bugatti,” a book for the refined Italian publisher Franco Maria Ricci in 1991 using film and a second one, in 2009 at the International Bugatti Meeting in Castiglione Della Pescaia, Tuscany. Here I shot in digital, using the Hasselblad H3DII-39 MS. The basic concept is very simple. 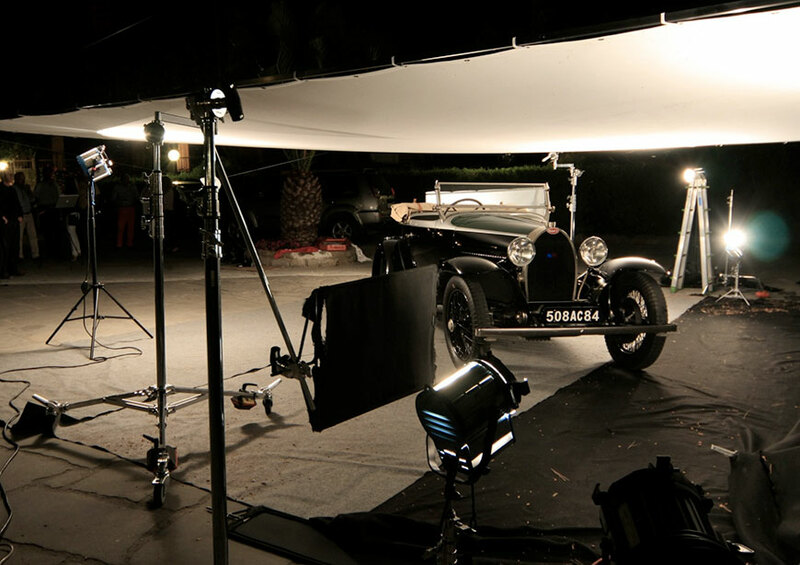 A white screen, larger as possible with two-four lights, possibly fresnel spotlights placed at the bottom of the screen to model the car with highlights and give structure to the image. Two more lights, spot or flood, set at the beginning of the screen to give a basic fill lighting and color. In Mulhouse 1991 and Castiglione 2009, the great star was the Avenger Butterly Modular Frame; it’s one of my workhorses. I use it as an immense reflector with a unique white textile also used for painted backgrounds in the film industry. Together with my spotlights, it allows me ultra-fine lighting control on location. Because it’s modular and detachable, it fits in the trunk of my car. It’s fast to set up and fold out, ready to mount on stands in a few minutes. I usually used the 20x20 feet – 6x6 mt model. In the graphic, you can see the setting of the lights. Two or four in the back of the Butterfly to give shape with the lights. Two on the first part of the butterfly like a fill light. A Bugatti Atalante. For the left picture, I used only the “shape lights” placed on the back side of the Butterfly. We will call it, scheme 1. produces a dramatic result, very impressive. However, it ‘s not acceptable if you must describe the car. You can see the position of the lights in the table above. Here the same Atalante, side view with scheme 1. Please notice the very fine lighting control that this system allows. It’s much more noticeable if you think that this picture was taken in location, out of the comfort of a car specialized studio. The Bugatti International Meeting 2209, organized by the Bugatti Club of Italy, took place in the Tuscan region of Maremma between May 23rd and May 30th. The gathering celebrated the centennial of the Bugatti foundation and brought 120 Bugattis and their crews to Castiglione. It was the largest Bugatti Meeting ever done. A stunning professional and human experience for me. 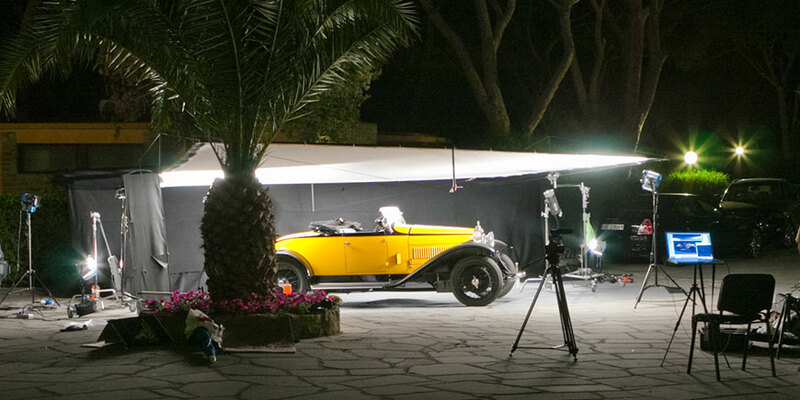 Bugatti Type 40 (1931) – Owner, Ivanno Frascari, Italy – The light scheme 2, very similar to the “Divina Bugatti” one. 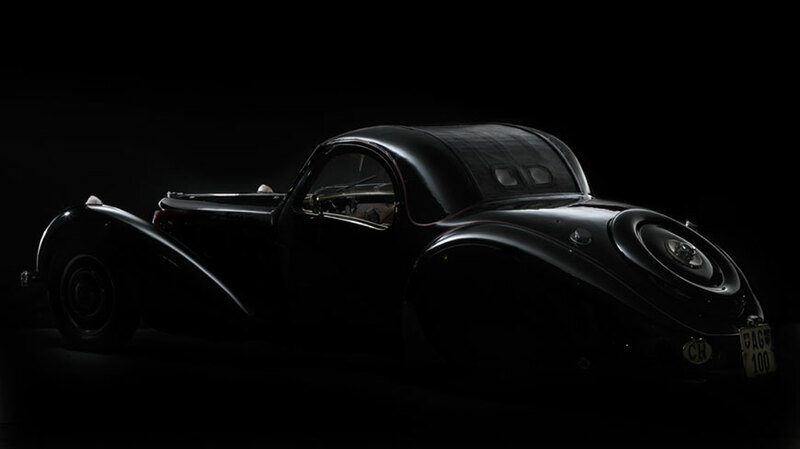 Bugatti Type 37A, “Flighty” (1928) – Owners, Frederica and Simon Fitzpatrick, Guernsey – The light scheme 2, adding a dramatic direct light from back-right giving tridimensionality. Below the backstage. Notice the big screen to protect the lens from direct light. 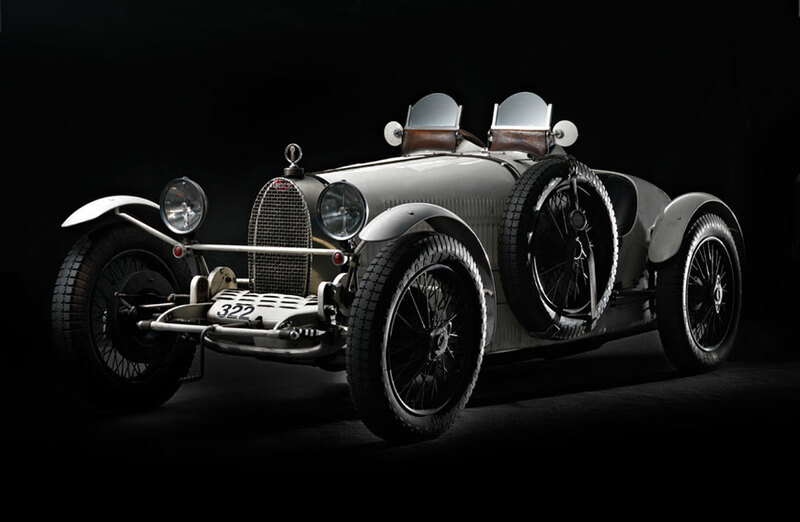 Bugatti Type 40 (1926) – Owners Gio.Ve:Old.Cars. His set was very similar to the one of Type 44 below. Below, Bugatti Type 44A – Owners, Philippe and Frederique Jaillon, France- Light scheme 2. Due to the difficulty of this shooting and to the color of the car I took several shots and combined the layers in Photoshop. In this case is important to work with an exact idea of what you will do in Photoshop after shooting. Hasselblad H3DII 39MS in multi-shot mode – zoom lens HC50-110 at 100 – 4 sec. F.16 – Many shot layered in Photoshop. 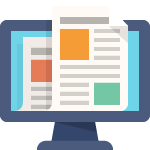 This approach and this schemes are suitable for several kinds of shooting. Here a brief gallery of different works I did with the Butterfly. I used this light schemes for different works. 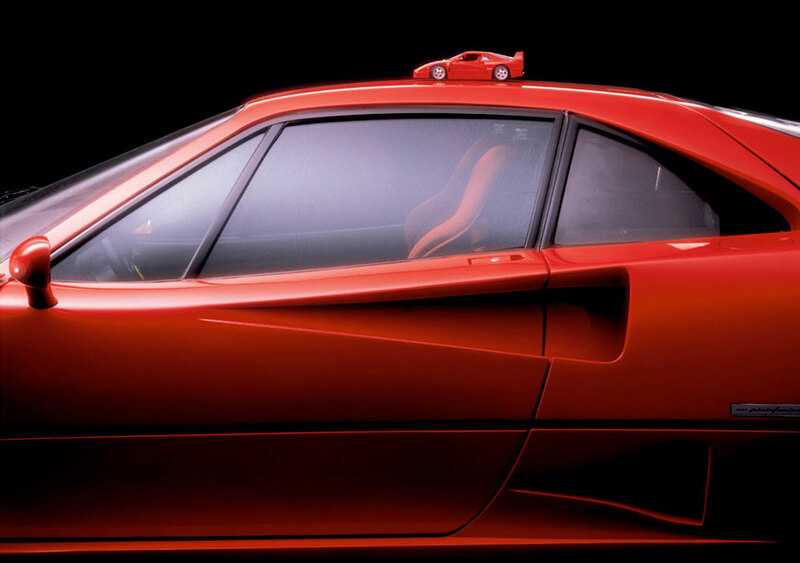 Here a Ferrari F40, scheme 2 with a very sophisticated mix of shape and fill lights. Here a Mercedes SL300 with a standard scheme 2. All pictures were taken with Avenger Butterfly Modular Frame. The same light scheme is suitable not only for cars but also for large reflecting objects. Below two beautiful armours.